excess estrogen exposure from outside sources (exogenous) such as food, water, drugs, lifestyle choices, liver impairment, and chemicals in the environment (EDCs) that act like hormones in the body and have complex epigenetic effects. 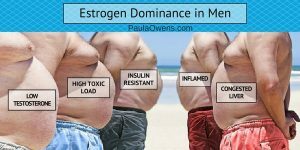 Estrogen dominance not only affects women, it’s also prevalent in men, teens and adolescents nowadays due to xenoestrogens aka estrogen-mimicking compounds or obesogens found in the food we eat, the water we drink, the air we breathe, the environment, and the products we use (shampoo, deodorant, dryer sheets, laundry detergents, fragrances, cosmetics, cleaning and gardening products, and all plastics). Whatever the source, estrogen dominance and chemical exposure produces unwanted side effects, disrupts metabolism, physiology, the microbiome, increases the risk of many serious health problems in humans, animals and aquatic life, and are a threat to human health. Adrenal insufficiency. Many symptoms of adrenal fatigue are very similar to those of estrogen dominance. Chronic stress produces excess amounts of cortisol, insulin and norepinephrine. When the adrenals become depleted, they may sequester progesterone to help make cortisol. The drop in progesterone can result in excess estrogen. Peri-menopause. Many women in their 30s and 40s find that their symptoms of estrogen dominance intensify as they approach peri-menopause. Nourish those adrenals ladies! Xenoestrogen exposure from endocrine-disrupting chemicals (EDC) such as plastics, phthalates, BPA, BPS, PCBs, pesticides, herbicides, industrial chemicals, cosmetics, personal care and household products. Besides having an estrogenic effect, xenoestrogens also have to be detoxified by the liver and compete with the same pathways to be removed from the body. These endocrine disrupting chemicals (EDC) accumulate in our bodies and are stored mostly in fat tissue. They can trick your body into increasing or decreasing hormone production or block hormone signals by binding to hormone receptor sites causing similar effects to those that a hormone would. Endocrine-disrupting chemicals affect fertility, thyroid function, puberty, sexual development, and increase risk of hormone sensitive organs such as the prostate and the breast. EDCs are especially harmful in young children and pregnant women. Exposure during pregnancy negatively affects hormone, physiological, neurological and brain development in offspring. Fibroids (uterine and breast), uterine cysts, ovarian cysts, PCOS (insulin-based or adrenal-based), and endometriosis. Uterine fibroids are caused by an increased ratio of estrogen to progesterone. Any progesterone that is not used by the body converts to estrogen in the liver. There is clinical evidence suggesting that progesterone creams are causing breast cancer too! Aromitization. Aromatase is an enzyme that converts testosterone to estrogen. Heavy alcohol use, insulin resistance, adrenal dysfunction, high cortisol, eating too many carbs, and chronic low-level inflammation upregulate aromatase. Simple diet and lifestyle strategies, and natural therapies can help optimize the delicate balance of your hormones, increase testosterone, support estrogen clearance and reduce estrogen dominance – naturally! Switch to organic foods. When shopping, look for certified organic, grass-fed, pasture-raised and GMO-free. This is a must to reduce estrogen dominance and is the only way to avoid the cocktail of chemical poisons present in industrially grown food. If you eat meat or dairy products, avoid those from factory-farmed animals that have been fed a diet of genetically modified corn, soy and grains, and injected with synthetic growth hormone and a boat load of antibiotics. Get enough vitamin B12, folate, betaine and choline. These nutrients known as methyl donors help to improve the biochemical process known as methylation, which is an important function in estrogen metabolism and detoxification. Good dietary sources include meat, fish, shellfish, eggs, spinach, beets and quinoa. Drink and eat from glass, stainless steel and ceramic containers. Even “BPA-free” plastics leach other endocrine-disrupting chemicals. Swap out Teflon cookware for ceramic or stainless. Teflon is a carcinogen and endocrine-disruptor. Never re-heat food in a microwave oven that is in a plastic container. The chemicals leach into the food. Switch to organic certified personal care and natural household cleaning products. Don’t trust a specific product just because it says “natural” on the label. Support healthy adrenal function. Adrenal insufficiency is the #1 hormone imbalance with women, and a common finding with increased estrogen. The adrenals play a huge role in balancing estrogen as they can make the same hormones as the ovaries. Eating too many carbs, drinking too much alcohol and caffeine, or simply having too much stress in your life depletes the adrenals. Support a healthy lymphatic system and optimize liver and gallbladder function. Those who have had their gallbladder removed tend to be estrogen dominant. A happy, healthy liver is essential for correcting estrogen dominance. Anything that impairs liver function or ties up the detoxifying function will result in excess estrogen levels. Install water filters in your home. Buy products that come in glass containers. Avoid canned and plastic items. Exercise daily to lower the amount of dangerous estrogen metabolites. Go easy on the alcohol. Circulating estrogen levels, cortisol and aromatase increase significantly in those who drink too much alcohol. Optimize the microbiome. Candida overgrowth, parasite, yeast, fungal and bacterial infections can significantly contribute to estrogen dominance, and increased estrogen increases the severity of Candida overgrowth and other infections. Cure constipation. Bowel regularity helps eliminate excess estrogen. Be informed that many drugs especially diuretics, antidepressants, antifungals, antibiotics, corticosteroids, HRT, oral contraceptives and anabolic steroids increase estrogen. Practice the 3 B’s for healthy lymphatic function: Bounce, Brush and Breathe! Rebound on a mini-trampoline for 5-10 minutes every day, practice deep breathing exercises, and dry bush your skin before showering. Identify and correct nutrient deficiencies (and excesses) and hormone imbalances through a functional blood chemistry analysis. Detox! Implement these everyday detox tips into your lifestyle. It’s a scientific fact that exogenous estrogen decreases systemic stores of vitamin B6, zinc and magnesium, and tend to alter thyroid function. 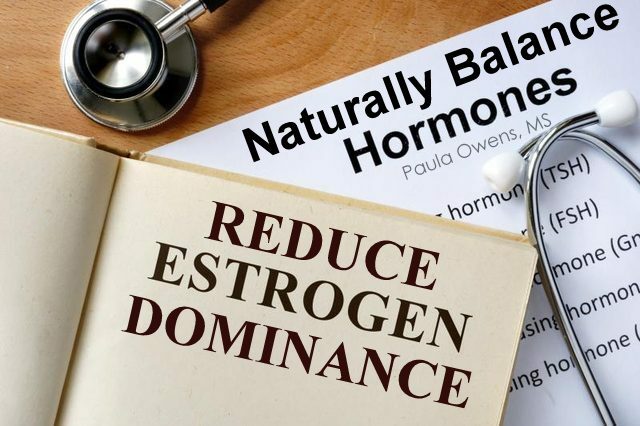 Correcting estrogen dominance involves more than just fixing the estrogen-progesterone balance and supporting the adrenals. It is important to eliminate the causative factors as much as possible. Adrenal insufficiency, insufficient sleep, chemical and toxic exposure, heavy alcohol intake, poor nutrition (high carbohydrates, low fat and protein intake, low nutrient value), and chronic stress are some common causes. Awareness and being proactive is key to limiting environmental exposure to xenoestrogens along with implementing proper diet, lifestyle choices, exercise and supplements that can help reverse the symptoms of estrogen dominance, support estrogen clearance, and balance hormones.